Hello and welcome to The Librarian & The Vine! Thank you for reading. I hope this column will have a little something for everyone–wine recommendations, of course, but also book reviews and even the occasional wine country travel piece. First, a little about me and how I got here. Since this is a column about wine, you are probably imagining that I’m a wine expert. Let me assure you I am not. I’m just a not-so- mild-mannered librarian with a bit of an obsessive streak. Most people, normalpeople, enjoy drinking wine and don’t really think much about it beyond finding something that tickles their taste buds and provides a mild to moderate buzz. I too started as a casual wine drinker, drinking what tasted good at the time and not thinking much about it. Of course, that didn’t last long because I am a librarian. We librarians like books. We like research. We like knowing things. What started out as a bottle shared with friends over dinner on Saturday night, soon turned into the passion obsession that takes up a huge chunk of my disposable income, shapes my social life and informs my travel. It turns out wine is incredibly fascinating and once I started my research, I was hooked! If you have any interest in history, travel or food (and honestly, what kind of person doesn’t love at least one of those things?) then wine is the perfect vehicle for further exploration. Wine’s place in human culture is unparalleled. We’ve been fermenting grapes for thousands of years. It’s part of religious sacraments. We use it to celebrate life’s victories and as a balm in defeat, even when defeat is just a grueling day at the office. It can make food more delicious and conversations sparkle. Of course, too much wine can make you slur your words and say very silly things as well, so moderation is always prudent. 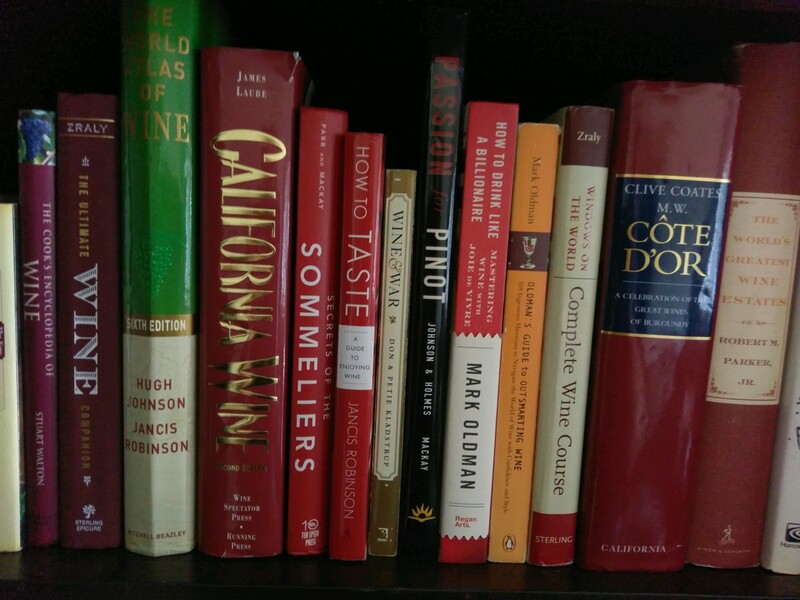 You may have guessed that my wine obsession did not stop with just researching wine. One thing I believe is true, no matter what you are trying to learn, is that you can’t just read about a thing. You need to actually do the thing in order to truly understand it. This is especially true of wine. Even if I could read every wine book ever written, my understanding would be incomplete without also tasting the wines I’d read about. Learning wine requires tasting A LOT of wine. Hundreds. Thousands. I was up for the challenge, but I knew doing it alone would have a) been a shame because wine, like life, is better when shared and b) given people the wrong idea about my drinking, most likely leading to an intervention. Fortunately, nearly all my friends have at least a passing interest in wine, so I was able to convince them we needed to start a wine club. Sure, they’re mostly interested in drinking wine, not hearing me drone on about the difference between Chianti and Chianti Classico, but they indulge me because the wine is usually pretty damned good, and the cheese is always outstanding. Over the past few years, our group has tried hundreds of different wines from all over the world. By actually tasting the wines I read about, I’ve learned more than any book could teach about different wine regions and varietals. I’ve also learned a lot about my own tastes—about what I like and what I don’t. I now feel fairly confident picking a wine from even the most intimidating wine list. And yet, I’ve barely scratched the surface. Wine is infinite. Knowing wine is a Sisyphean task, though certainly a fun one. You may have a handle on California wine, but what about France? Bordeaux is fairly straightforward, but Burgundy is daunting. Don’t get me started on Italy. There is always another country/region/grape to learn. In much the same way that I’ve always felt a small pang of grief for the countless books in the world I’ll never get to read, I also lament the many wines I will never taste. That said, I’m determined to try as many as I can. In the case of wine, the old saying that it’s about the journey, not the destination is spot on. The pleasure of discovering new wines or rediscovering old favorites with good friends and good food is the real point. Wine is made to be drunk. And to give some small joy to the drinkers. That’s the main reason I’m writing this column—to share my adventures with you and, hopefully, inspire you to round up a few friends and a few bottles and start a journey of your own. Cheers!